Have you ever thought you could run one marathon? What about 100 of them? As crazy as it sounds, this is the challenge Olivier Lacoua from Paraparaumu has set himself to raise money for New Zealand Red Cross. Rain or shine - nothing will stop Olivier Lacoua from reaching his target of 100 marathons. Olivier's obsession with marathons started nine years ago, after his first successful race in Christchurch. "I was nicely surprised to see how fit I was and how well my body handled the race. I did a few more marathons after that, then I thought to myself ‘why not run 100 marathons?’” says Olivier. He says his goal became meaningful, and therefore motivating, the moment he decided to raise money for a charity. Choosing a charity was easy for Olivier - Red Cross has had a special place in his heart for a long time. When Olivier was 18 years old, he went on a school trip to Spain where a pot of boiling hot milk fell on him. The local Red Cross took care of him – something Olivier never forgot. So far, Olivier has run 79 races and raised over $44,000 through sponsors, fundraising dinners, auctions, movie nights and many other events. He was initially hoping to raise $26,200 at the end of his 100th marathon in 2020, but so far Olivier has already increased his target three times. “I originally made my target $26,200, because 26.2 is the number of miles for a marathon. However, I have raised a lot more, so I have changed my target to $42,200 as 42.2 is equivalent in kilometres to a marathon. But now, I have reached my new target again, so I have increased it to $50,000,” says Olivier. Olivier running in the Saraha desert the Marathon des Sables. In April, Olivier ran the Marathon des Sables (‘The Marathon of the Sands’). 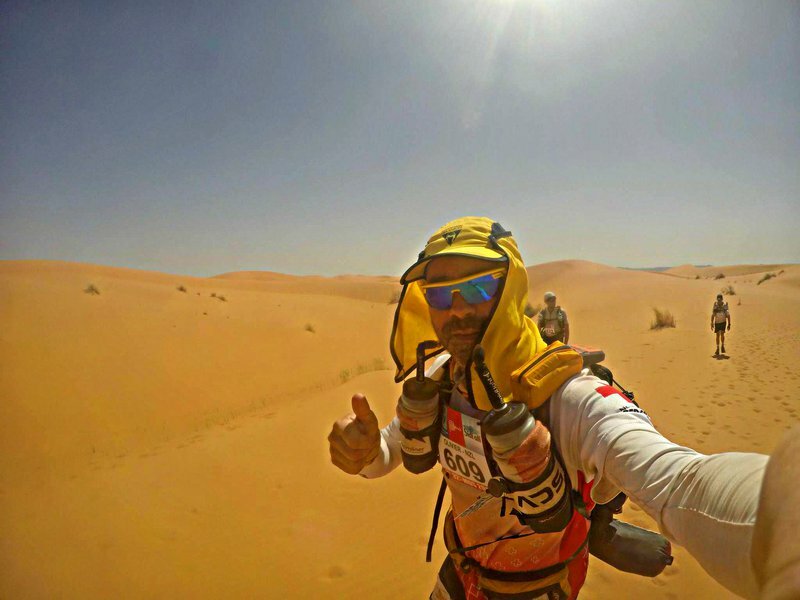 This ultra-marathon is the toughest one Olivier has ever done and is arguably the toughest in the world: 250km over six days in the Sahara desert, where temperatures can reach 50 degrees Celsius during the day, and drop down to 3 degrees at night. “I will certainly remember the strong heat coming from above my head but also below my legs from the sand dunes, the steep climbs to the top of the jebels, the camp experience using limited resources to live, eat and sleep, the amazing camaraderie of many people who came from around the world. A true amazing experience which was highlighted by the generosity of many people who supported me and New Zealand Red Cross", says Olivier. You can support Olivier in his amazing challenge on his fundraising page and follow his personal journey on his Facebook page.